Hair loss is a perfectly normal part of your hair's growth cycle and one of the many loses that a person experiences as they age. Your hair grows in cycles ranging from two to six years, after which time the follicles shed the hair and pass into a resting phase, which lasts for about three months and then fall out. This is followed by a new hair growth cycle. It is common to lose between 50 and 150 hairs daily from this hair shedding and these hairs are replaced by the growth of new hairs. 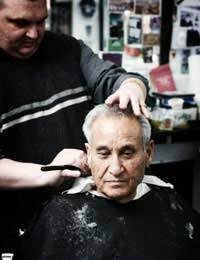 But with Ageing Hair, replacement is slowed down, so loss becomes more gradual and eventually permanent. This type of hair loss can be partially circumvented and even reduced by clearly understanding the mechanism of hair growth and loss. The growth process takes place utilising hair follicles which contain living tissue and proteins. This hair falls out sometime during a two to six year timeframe. Subsequently new hair will grow in, taking the place of the old hair follicle. During your more youthful years, it is relatively straight forward for your body to produce the correct proportions of proteins required for a good head of hair. This is not the case as you age, because the protein levels required for your hair differ as your hair growing rate differs. As you age, the rate at which your hair follicles replenish themselves starts to dwindle. This follows the natural course of your body – which with age also begins to reduce its ability to regenerate itself. Therefore, less protein is synthesised in your body since less growth and changes are taking place, and this diminution could lead to your hair falling out and only a slow rejuvenation of new hair. Meanwhile, some thinning out and balding will probably take place, with an overall loss of hair. It is not uncommon to experience loss of pigmentation from your hair as you age. This means that in addition to the loss of hair on your head, your individual hairs could get thinner and smaller. This is thought to be due to the fact that as one ages, the thickness of your hair changes. Hair loss is more common among men, who are ageing, than for women who are ageing. With men – hair loss takes place from the scalp front and proceeds backwards. These losses are influenced by protein, pigment and by the conversion of testosterone to dihydrotestosterone (DHT) – which makes the protein and pigment interact differently and produce less hair. With women, the loss of hair results only in a Thinning Of Hair because of insufficient pigmentation production. How Can I Encourage My Hair Growth? If you are ageing and see that you are losing hair, then you should be happy, because you are a very normal and healthy person. In order to encourage a diminution in your hair loss, it would be smart to increase your dietary intake of proteins or find suitable protein supplements to enhance this (see our article Diet and Hair Loss for more information). Welcome to the club of living and enjoy ageing gracefully – that's the way to go!